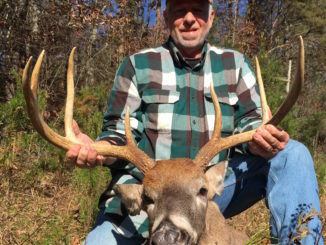 Richard Windon of Creedmoor, N.C. doesn’t mind other hunters calling him “green,” since he has little experience pursuing wild game, but plenty of other hunters are likely green with envy after Windon’s first hunt produced two fine bucks, including a big 10-point with a wide and bulky rack. 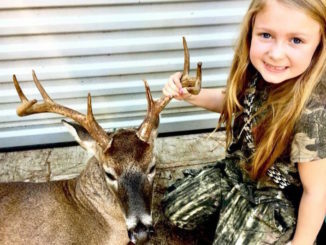 With only one hour to hunt on Nov. 16, Ronnie Howard of Union Grove, N.C. cracked off the perfect kill shot on a 131-inch Iredell County trophy 7-point buck. The big deer sported 11-inch G2’s, 5-inch bases, and a whopping 23-inch inside spread. 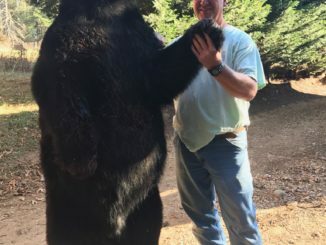 Hunter ambushes 633-pound black bear in Eastern N.C.
Michael Carawan of Garner, N.C. almost didn’t hunt the biggest bear he’d ever seen on his trail cameras. 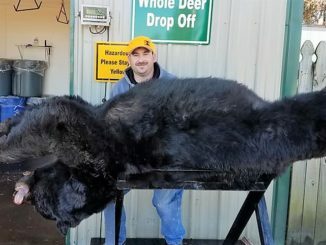 He thought it would take a helicopter to retrieve the 633-pound monster black bear from a Pamlico County swamp. Then he came up with a different strategy, and killed the bear on Nov. 25. North Carolina is rightfully credited with having the world’s biggest black bears, but almost all of those enormous specimens come from the eastern third of the state, which features what is possibly the world’s best habitat for bruins. Accomplished Helena, Ark. 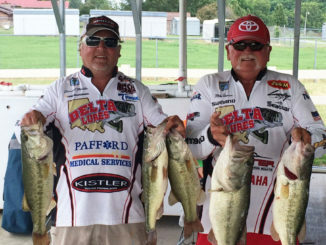 bass angler Derward Mauldin has heard that question many times before in his boat when he’s fishing with a Delta Lures buzzbait during tournament action in Arkansas, Mississippi or Louisiana. It’s perhaps the ultimate compliment, or endorsement if you will, for any artificial lure manufacturer who puts a product on the market. 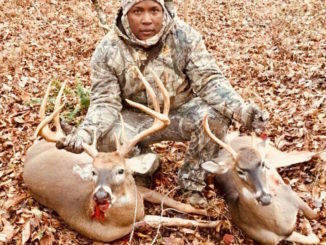 The 2017 deer season was one of the best ever for Charles “Chad” Thousand of Greensboro, N.C. — until it wasn’t. 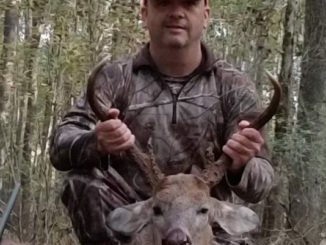 Neal Collie of Nashville, N.C. knows that antelope don’t live in the Carolinas, but after he killed a 4-point buck with a unique rack during a trip to the Upper Roanoke River Game Lands, he was almost convinced otherwise. The “Antelope Buck” he killed while on a guy’s getaway looked strikingly similar to the popular western game animal. 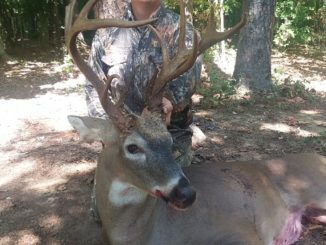 Easley, S.C.’s Zach Phillips killed the biggest buck of his life last month. It was a proud moment for him after pursuing the buck for more than a year and taking great care to not pressure the buck unnecessarily. 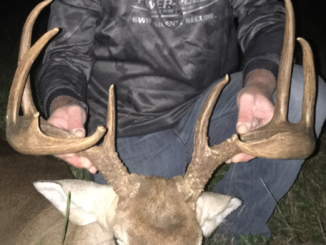 When Brandon Dimont of Belew’s Creek, NC jumped a big buck on his usual path to his box stand on the opening weekend of muzzleloader season, he knew he would need to find an alternate route for the future. 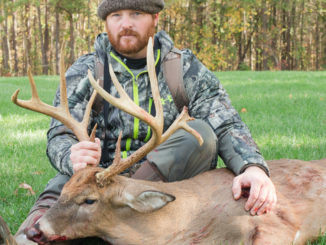 Two weeks later, on Nov. 11, he snuck in the back way and laid down a 144-inch, Alamance County 12-point. 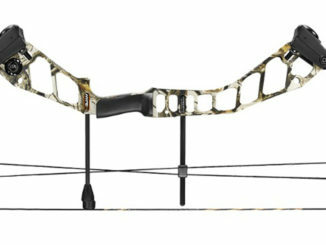 Not many years ago, compound bows offered little in terms of adjustability. 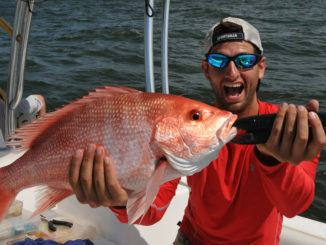 Most models featured only 10 pounds of draw-weight range, and at most, only 3 inches of draw-length adjustment. For many first-time archers, this meant starting out shooting a higher draw weight than they were comfortable with so they wouldn’t have to purchase new limbs for a higher poundage later. Worse yet, parents of youngsters who were still growing often had to purchase several bows before their child reached adulthood.